Back in late July, I made an extract-based Belgian Single using a recipe from E.C. Kraus. 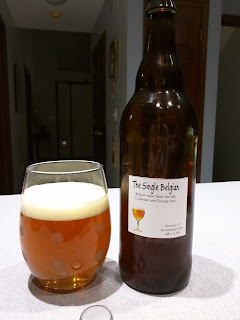 The beer turned out to be one of the better ones I've made, and we've gone through (and given away) almost all of it, so I decided to try brewing a second batch. The first hops addition was switched from a pre-boil addition to a post-boil addition. Hops amounts at the 60-minute and 15 minute levels were dialed back to reduce the undesirable bitterness I perceived last time. Safbrew Abbaye yeast was swapped out for Wyeast 1762 which was in the original Kraus recipe but not available to me when I made version 1.0. Brewer's Crystals (a sugar mix replicating the fermentable sugar in barley malt) were added to boost the alcohol content and maybe dry it out a little. Reducing the hops amounts meant that I was going from a calculated 28.8 IBUs down to 21.1 IBUs. The original beer had a gravity of 61, so its BU:GU ratio was 28.8/61 or 0.47. The new recipe has an estimated original gravity of 53, so its BU:GU would be 21.1/53 or 0.40. That's a pretty significant drop but my suspicion is that the Wyeast product might ferment out more of the sugar as I plan to give it more time in the fermenter than I gave the Safbrew Abbaye and will be oxygenating it to help it along. I'm also using temperature control on the fermenter to keep the yeast at the upper end of its temperature range, which may dry the beer out more and increase ester production. Smacked the Wyeast package to activate the yeast while gathering and measuring ingredients, to ensure it had time to warm up, activate, and become ready to use. Added the specialty grains in a steeping bag into the water and steeped them for 20 minutes. As the grains steeped, I heated 3 gallons of water on the kitchen stove to near-boiling and removed it from the heat. I dissolved 3 pounds of DME into it. Poured in the 3 gallon batch of dissolved DME and made sure the water level in the Grainfather registered 6 gallons. Set the Grainfather to boiling and brought the wort to a boil. After 50 minutes, hooked up the counterflow chiller and began recirculating wort into the kettle to sterilize the chiller. At 60 minutes of boil, turned off the heat. Turned on the cold water supply to the counterflow chiller and continued recirculating wort into the kettle until the Grainfather kettle temperature read 140F. Turned off the pump and moved the cold wort out line into the fermenter. Turned the pump back on and pumped wort into the fermenter. Fermenter temperature read 70.2F when all the wort was pumped into it, making it an ideal temperature for the Wyeast yeast (which has a range of 65-75F). Using an oxygen tank and stone, oxygenated the wort for 60 seconds. Took an original gravity reading and volume (5.7 gallons at 15 Brix or 61.1 SG). Pitched the yeast packet into the wort and sealed the fermenter. Now it was up to the yeast. My primary fermenter for this batch was an SS Brew Tech Brewmaster Bucket. This is a stainless steel conical fermentation bucket that I recently acquired and think is one of the best pieces of brewing equipment I own. In the version 1.0 beer, I got a bit more carbonation than I expected and the beer was a little sweeter than I thought it should be. For that reason, I decided to keep the fermenter at the upper end of the range for the first two weeks of fermentation, then remove the temperature control and allow it to spend an additional week at the basement's ambient temperature of 68F. At the left, you see a glass of the finished beer. It turned out only very slightly hazy, with a finger-thick white head that lasted several seconds before reincorporating into the beer. The carbonation level was good, not overly bubbly or particularly flat. The use of bottle conditioning yeast and fermentation drops seems to have worked well. The aroma is malty but not sweet, and slightly fruity. Compared with version 1.0, it's much less sweet and the bitterness from the hops is well-balanced against the malt. I wondered if the coriander would be an obvious element of the flavor, but it's barely detectable, which is what I'd hoped to accomplish. The sweet orange peel doesn't come through, however. There is a roasty element to the flavor, probably from the aromatic malt. Had this come from a micro brewery in town, I'd have rated it an 8 out of 10, so I am very happy with it. It's a very easy to drink beer, with a little complexity in the flavor and no serious flaws. I would definitely increase the amount of sweet orange peel. I like the flavor it lends to a beer like this, and I would like it to be just barely detectable in the finished product. Although I like aromatic malt, I think the recipe includes too much of it. It's a dominant element in the aroma and flavor. I'd like it to be a bit more subtle. I might consider going back to the Safbrew Abbaye yeast, as it's less expensive and I don't feel like the Wyeast Belgian Abbey II contributed much to the flavor. I might also consider carbonating the beer with a clear or amber candi syrup to increase the Belgian-like flavor a bit more, or adding some late in the boil. I will probably convert to an all-grain recipe next time as well. All this being said, I'm very happy with how this turned out and I think it's a definite improvement over the original version 1.0. Bob Sandage and Phil Farrell gave a presentation at the American Homebrewers Association (AHA) conference this year entitled "Does the Type of Fermenter Affect Your Homebrew?" Their experiment revolved around brewing a large commercial-sized batch of Kolsch. The style was chosen because it would easily show any unexpected fermentation issues or differences, and required no post-fermentation processing that might have affected the flavor of the finished beer. The large commercial-sized batch was divided into a variety of different fermenters used by homebrewers, including plastic buckets, carboys, cornelius (corny) kegs, and stainless steel conical fermenters. Where possible, blow-off tubes and poppet style airlocks were also used to gauge any difference these might make. Finished beers went through a blind taste-test to determine which tasted the best. They were also subjected to a laboratory analysis. The taste test rated the beer fermented in a carboy with a blow-off tube and the beer fermented in a stainless steel conical fermenter with a poppet airlock as the two best. Laboratory testing rated diacetyl and pentanedione levels highest in the samples fermented (in order) in the carboy with blow-off tube, plastic bucket, corny keg, and carboy with poppet airlock. Levels were lowest in the commercial unitank fermenter and in the stainless steel conical fermenters. Levels in the smaller conical fermenters were comparable to those in the large commercial unitank fermenter. To me, the take-away here was that you'll probably get your best results overall in a stainless steel conical fermenter. This would seem to minimize unwanted compounds while resulting in a beer that scores well with taste testers. Fortunately, I recently added an SS Brew Tech Brewmaster Bucket to my setup. This conical stainless fermenter should help improve my beers. If a stainless steel conical fermenter is out of your price range, a glass carboy with poppet airlock is your next best bet. It is recommended to use Wyeast 1084 Irish Ale, White Labs 004 Irish Ale, or Danstar Nottingham. Since I ordered the kit during the warmer months, I settled for Danstar Nottingham dry yeast. Heat 2.5 gallons of water to 150-160F. I used The Grainfather to do this. Drop the bagged grain into the water and steep for 20 minutes. Remove the grain from the water and let it drain, then discard. In my case, while doing the above, I heated 3 gallons of water in a kettle on my kitchen stove and removed it from the heat, I dissolved the 6 pounds of Pale LME into that and made sure it was thoroughly dissolved. I added the dissolved Pale LME to the existing wort and topped it off to 6 gallons with cold water. Experience has shown me that The Grainfather boils off about a gallon in an hour. I set The Grainfather to boil and stirred to ensure that the wort was well mixed. When the wort reached a boil, I dropped the Willamette hops in a bag into the kettle. While the wort boiled, I rehydrated the yeast packet. After 55 minutes of boiling, I attached the wort chiller and began recirculating wort through it to sterilize it. The output of the wort chiller went into the kettle to be re-boiled. At the 60 minute mark, I turned off the heat. I turned on the cold water supply and let the wort flow through the counter flow chiller and back into the kettle. Past experience has shown me that the wort coming out of the chiller is often around 80F. I wanted this to come out closer to the recommended 64-72F temperature when it reached the fermenter, so recirculating a bit before pumping into the fermenter would help accomplish that. When the kettle temperature read 150F, I turned off the pump and put the cold wort out line into the fermenter. The chilled wort was pumped into the fermenter. The measured temperature in the fermenter was XXF, close to my desired range. I pitched the yeast into the wort and sealed the fermenter, attaching an airlock filled with Star San sanitizer. AIH's instruction sheet said that my wort should have an Original Gravity of 1.045, a final gravity of 1.012, and an ABV of 4.6%. My pre-boil gravity was 1.047 SG, but the volume was a little low, so I topped it off with water to hit the right volume. Post-boil gravity measured with a refractometer was again 11 Brix or 1.047. My stout would be slightly stronger than designed. I have to say... if you like chocolate this is a great beer to brew. The malt combination here gives off a delicious dark chocolate aroma as the beer boils. The minimal bitterness (estimated 18 IBUs) means that there isn't a strong hops aroma in the boil, either. Yield was estimated at 5 gallons for the recipe. I would up with 4.7 gallons in my fermenter at the time I pitched the yeast. Because I don't have a fermentation chamber yet, the plastic bucket fermenter was placed in my basement, which maintains a 68F temperature pretty much year-round. Fermentation didn't seem particularly vigorous. I checked it a few hours after pitching the yeast and saw nothing happening in the airlock. A day later, still no visible activity. Finally, after seeing no airlock activity for two days, I popped open the fermenter lid to see a nice healthy krausen. The fermentation was going fine and I was just too impatient. I sealed the lid and left it alone after that. I took small samples of the wort over the next week or so and watched the gravity gradually decline. When it seemed to level out, primary fermentation was finished. This happened on approximately Day X of the fermentation. The AIH instructions say that the peanut butter flavoring should be added after the beer completes primary fermentation in about two weeks, then let it spend at least a week in secondary. Since I don't rack off my beer to a secondary, I added the flavoring at the two-week mark and left the beer in the fermenter another week. I used corn sugar (just under half a cup) and water to prime the beer for bottling. I boiled the mixture for 5 minutes and then allowed it to cool to room temperature while sanitizing bottles and the bottling bucket. When the priming sugar was ready, I poured it into the bottling bucket and used gravity to transfer the beer from the fermenter to the bottling bucket. The fermenter had a thin layer of dead yeast and other material across the top, one of the thinnest I'd encountered to date. There was also a very thin layer of sediment in the bottom of the fermenter, about an eighth of an inch deep. The sediment seemed almost stuck to the bottom of the fermenter, allowing me to transfer most of the beer to the bottling bucket. The wasted beer in the fermenter couldn't have been more than a cup. The beer pours a perfect dark brown stout color. 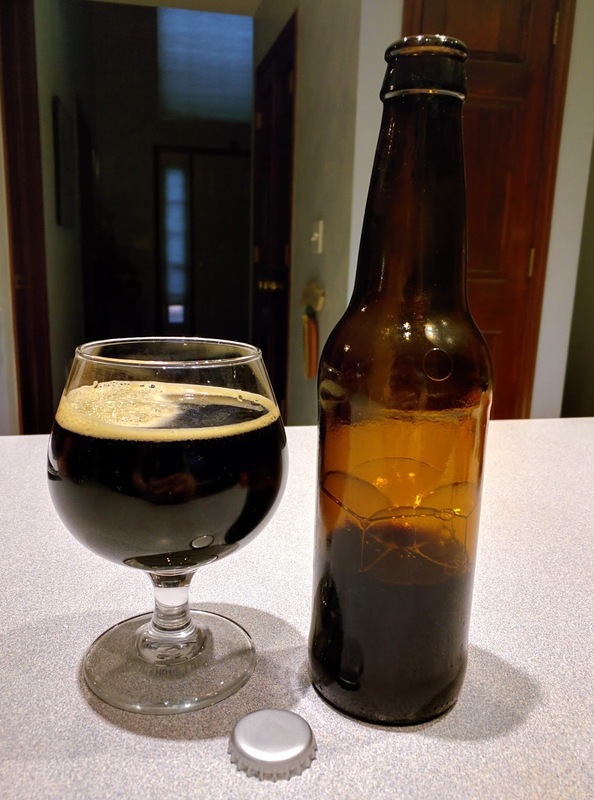 The aroma has a strong peanut butter element, with some roasted malt, chocolate, and coffee behind that. The flavor is predominantly roasted grain, coffee, and a little chocolate. The peanut butter in the flavor seems fairly subdued. Although stouts aren't overly carbonated, I think this one could do with a little carbonation. It feels a little watery compared to a couple of stouts I've had recently from local craft breweries. One of those was a nitro stout, so that's not an entirely fair comparison. I would consider adding something to give this a little more body if I was going to make it again. Hops bitterness is nicely balanced in this one. The fact that it's not sweet or cloying tells you hops bitterness is included, but it's not what you'd call a hoppy brew. The majority of the bitterness in it seems to come from roasted grain. AIH rates this an easy kit, and I can't argue with them. Steep the grains, add the extract, bring to a boil, add the hops, wait a bit, chill it down, pitch the yeast, ferment for a while, add the peanut butter flavoring, wait a week, and bottle. Not too tough if you've been brewing a while. In terms of the brewing process on this one, the only part that was kind of a nuisance was dealing with the extract - but that's only because I wanted to do the boil in The Grainfather so that I could leverage its fast counterflow wort chiller at the end. I don't plan to make a habit of using the Grainfather in this way as it's not really designed for it, and I'm planning to go all-grain as soon as I use up my remaining extract kits. Dissolving the extract in another pot and transferring it to the Grainfather for the boil worked as a solution for dealing with extract and not triggering the Grainfather's scorch protection. If I was going to make this beer again, I'd start with the all-grain kit instead of the extract. At the time I bought this one, I didn't have the equipment for an all-grain brew. I would also add some oatmeal or something to improve the body, and perhaps some powdered peanut butter to enhance the peanut butter flavor (the aroma of peanut butter is perfect in this one, but the flavor is hard to detect).